2.Purchase the Godrej Expert Rich Creame Hair Colour of Rs 30. 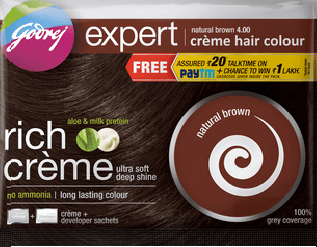 Note : Buy the latest pack of Godrej Expert Rich Creame Hair Colour in which paytm offer mentioned. 3.At the inside of the back you will get Rs 20 paytm cash code. 2.Now Answere the Simple question,you can choose between yes or no. 5.Rs.20 Paytm Cash code will be added to your account instantly.